Tykes Oli McBurnie. Picture Tony Johnson. Barnsley’s midweek trek to Suffolk proved fruitless as they were beaten by Jonas Knudsen’s second-half strike. The Reds missed the chance to ease themselves out of the Championship drop zone, and now Jose Morais’s men have just four games left to save themselves from relegation. The Reds initially impressed as they sought to carry on the momentum following the weekend win over Sheffield United. They were denied by the woodwork after only five minutes. The recalled Adam Hammill lofted a super cross for Kieffer Moore, only for his header to thump the crossbar. Minutes later, Hammill’s deep cross almost floated into the far corner of the net before keeper Bartosz Bialkowski was acrobatic in clawing the ball clear. In the 25th minute the visitors produced a super move, which culminated with Brad Potts firing into the side-netting after he had combined expertly with Hammill. Town were denied brilliantly by Adam Davies just past the half-hour mark. The Reds’ ‘keeper was superb in denying the hosts’ Albanian star Bersant Celina in a none-on-one situation. As half-time approached the Reds made progress again. The small pocket of travelling fans were celebrating in the 38th minute, only for Lloyd Isgrove to be adjudged offside after he had tucked home a cross from Gary Gardner. If the second period, Oli McBurnie curled in a sweet shot which skimmed the crossbar after he had linked up well with Moore. Former Millers man Moore then nodded wide as he got up well to meet Isgrove’s cross. Nine minutes after the restart the hosts struck. Danish defender Knudsen headed Ipswich ahead as he converted a tempting corner-kick delivery from Mustapha Carayol. It was almost 2-0 with 16 minutes to go. Celina was in space in the Reds’ box, but his close-range effort was beaten away by Davies. Ipswich (4-3-3): Bialkowski; Cotter (Ward, 56), Spence, Carter-Vickers, Knudsen; Kenlock, Skuse, Connolly; Carayol (Folami, 60), Celina, Waghorn. Subs not used: Crowe, Hyam, Sears, Nydam, Gleeson. 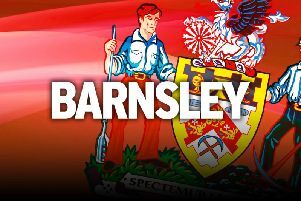 Barnsley (4-3-3): Davies; Yiadom, Jackson, Lindsay, Fryers (Mallan, 81); Potts, Gardner, Hammill (Bradshaw, 64); Isgrove (Hedges, 56), Moore, McBurnie. Subs not used: Walton, McCarthy, Pinnock, Mahoney.